The BEGO Collagen Membrane is indicated for use as a barrier membrane in guided bone and tissue regeneration techniques (Fig. 1). 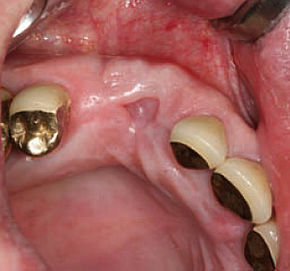 The loss of volume of the alveolar ridge that regularly occurs after tooth extractions can compromise the hard and soft tissue situation for implants and thus the aesthetic outcome (ROTHAMEL et al., 2010). Rothamel et al. 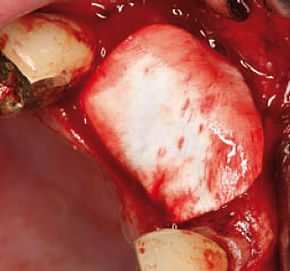 (2010) describe various techniques for preserving the alveolar ridge after extractions and discuss the treatment of an extraction socket with granular, allogeneic bone substitute and a pericardial membrane that underwent a clearly accelerated resorption process due to open healing. 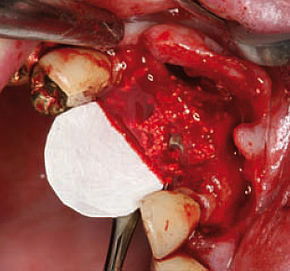 Open coverage of extraction sockets using a membrane is a special case because of the small dimensions of the defect (ROTHAMEL et al., 2011; ELIAN et al., 2007; FROUM et al., 2004). They also describe the use of the pericardial membrane on the buccal and crestal aspects after augmentation with a bovine bone substitute designed for volume stability to treat a large apical fenestration defect on tooth 26 (ROTHAMEL et al., 2010). In a human histology case study by ROTHAMEL et al. 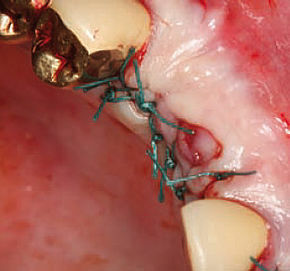 (2011), the BEGO Collagen Membrane was used to cover a fascial maxillary sinus window with simultaneous crestal augmentation as part of an external sinus floor elevation. The key features of the BEGO Collagen Membrane are considered the appropriate barrier function to protect areas of bone regeneration, the reliable exclusion of soft tissue from the regeneration zone and the permeability to nutrients. The morphological structure of BEGO Collagen Membrane produces a multidirectional stability, which means the membrane is resistant to tearing but cannot be stretched. Hydrating the BEGO Collagen Membrane achieves adhesion to the bone wall surrounding the defect. The membrane does not adhere to itself, which makes application as part of guided bone and tissue regeneration techniques easier. The BEGO Collagen Membrane can be applied wet or dry. The time required until the membrane is completely penetrated by fluid is determined by the viscosity of the medium. The viscous character of blood increases the time required for penetration of the porous, honeycomblike internal structure of the BEGO Collagen Membrane. Moistening the membrane beforehand with sterile aqueous solution can shorten the time required until the blood penetrates the membrane. The BEGO Collagen Membrane is characterised by a very dense collagen fibre structure. Elastic fibres also run between the fibrils of the type I collagen and are directly responsible for the multidirectional stability of the membrane (see ROTHAMEL et al., 2012 for a summary). As shown in Fig. 2 (A, B), the inner part of the membrane is porous and features a multilayered structure with connecting elastic fibres that contribute to the multidirectional stability (see ROTHAMEL et al., 2012 for a summary). While the BEGO Collagen Membrane can maintain a cell-occlusive barrier function for at least three months, it is postulated that the barrier membrane is permeable to nutrients to ensure adequate nutrition for the covering bony regenerating zone (for a summary of the properties of collagen, see SCHLEE et al., 2012; GHANAATI, 2012; ROTHAMEL et al., 2005; LOCCI et al., 1997; HUTMACHER et al., 1996; YAFFE et al., 1984; POSTLEWAITE et al., 1978). Eight weeks after a tooth extraction, there is incomplete healing of the extraction sockets of 13 and 14 with a buccal defect formation. Palatal placement of an adapted BEGO Collagen Membrane and application of BEGO OSS S on the exposed implant thread. After rehydration, the BEGO Collagen Membrane showed outstanding adaptation to the contours to stabilise the augmentation material. Tension-free wound closure following a periosteal releasing incision is made easier thanks to the thinness of the membrane.